Fans line up early on September 13, 1954 outside of Lane Field (Broadway and Pacific Coast Highway) to buy tickets to the one-game tie-breaker that would determine the winner of the 1954 Pacific Coast League Pennant. The Padres and the Hollywood Stars tied with 101 wins. PART 1: PILLARTOPOST.ORG’S SALUTE TO MAJOR LEAGUE BASEBALL’S OPENING DAY WEEKEND. In San Diego this afternoon, the first pitch of the 2019 Major League Baseball season will be tossed at Petco Park. This reporter’s eyes will be glued to the television set to watch the Padres battle the San Francisco Giants. 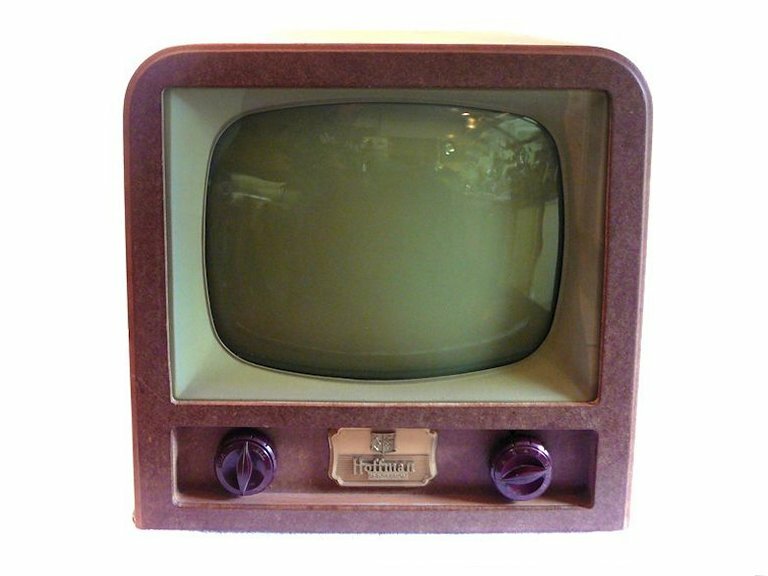 In 1954, these then much younger eyes were also glued to the TV set (a Hoffman E-Z-vision with rabbit ears). 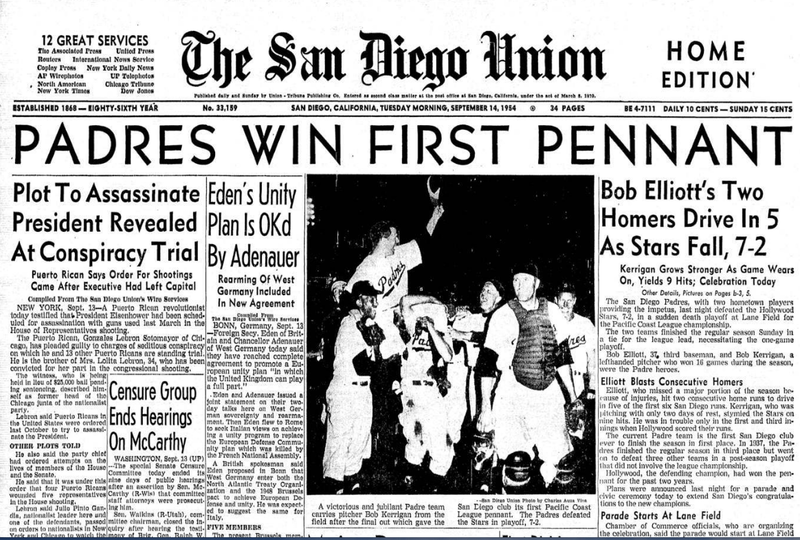 The occasion then was to watch the first official televised baseball game in San Diego on September 13, 1954 when the Padres (then members of the minor-league Pacific Coast League) battled the dreaded Hollywood Stars. Both teams ended the 1954 season tied for first place with 101 wins and 67 losses. Given the PCL had a playoff series to determine the eventual league champion, a one game tie-breaker was ordered. The four team playoffs needed a pennant winner in order to seed the teams. Playoffs were called the Governors Cup. KFMB, the local CBS affiliate, broadcast the game in living black and white. The Padres won the game 7-2 thanks to the heroics of a pair of Bobs. Bob Elliott, a former major league star contributed two home runs, while lefty Bob Kerrigan pitched the entire game. before a standing room only crowd of 11,471. Euphoria erupted in San Diego given the sold out crowd (11,471) playing at Lane Field (Broadway and Pacific Coast Highway) plus the attention from who knows how many viewers watching the nascent TV game broadcast. 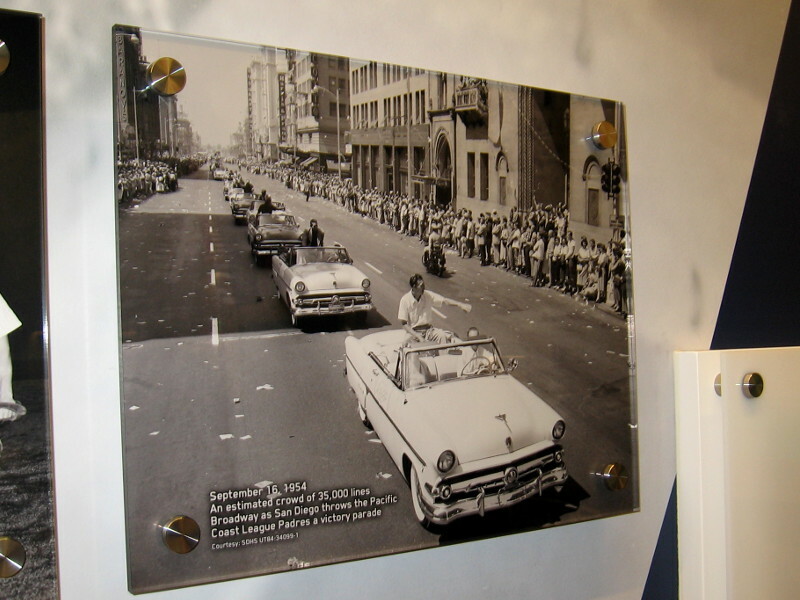 A Chamber of Commerce organized parade ensued down Broadway even after the Padres were bounced from the playoffs (parade: Sept. 16). 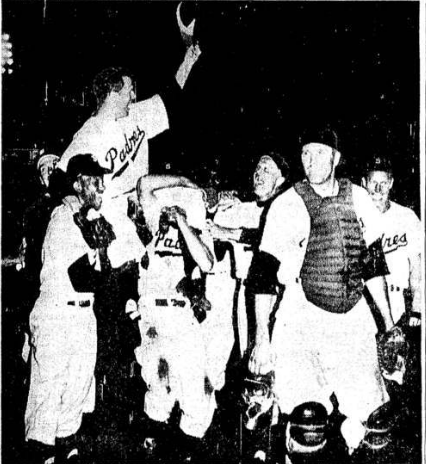 Padres in the playoffs ended up being defeated in the first round by the 3rd seeded Oakland Oaks (the eventual 1954 playoff victors). And, no one in Sunny Jim gave a hoot about the Oaks. Who needed a playoff? Padres were the regular season pennant winners outright—nothing else mattered. Thirty years later in 1984, the major league version of the San Diego Padres earned their first World Series appearance. The second and last World Series appearance for the local team happened in 1998. Petco to this date remains without a World Series game played on its lovely confines. Maybe this is the year for another pennant! Only in America would a ball game victory capture page 1 coverage given the other dramatic headlines on the page.